Cheteshwar Pujara was the hero of the day for India. 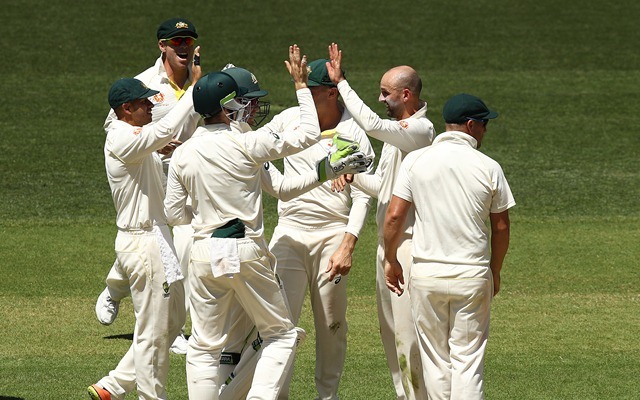 The much-awaited Test series between Australia and India got underway today in Adelaide with the visitors winning the toss and opting to bat first. But they blew away a great chance to bat big in the first innings of the series only for Cheteshwar Pujara to score a superlative century. He scored 123 runs and battled along for his team when the things looked grim. Even the lower-order supported him well as it all started with Ravi Ashwin, who along with Pujara, rebuilt the innings with extreme patience as the Aussies tested them to the hilt. But the duo, especially Pujara didn’t give up and continued marching along. They added 62 runs for the seventh wicket after they were left reeling at 127/6. It was the only period when Team India looked in control during the whole day. Ashwin got a good nut from Pat Cummins and then started the famous lower-order resistance. Ishant Sharma is known to stay put in the crease even as Pujara farmed more strike against the pacers. India’s best number three put an exhibition in the middle of some trademark strokes to leave the crowd in awe of him and stitched 21 runs with his lanky partner. Just when one felt that things will end quickly, Mohammed Shami also batted well at the fag end of the day to frustrate Australia even more. Meanwhile, Pujara upped the ante and accumulated some quick runs to race past the 100-run mark to register the 19th ton of his Test career. He continued taking on the fast bowlers by pulling and punching the short balls on the back-foot. However, in a bid to retain the strike on the second morning, Pujara tried to take a cheeky single on the penultimate delivery of the day but Pat Cummins’ sensational direct hit caught him short of his ground. He was dismissed for 123 off 246 deliveries with seven fours and a couple of maximums as India ended the day on 250/9 after 87.5 overs. They would now look to add as many runs as possible on the second morning and then will have to bowl extremely well to make a comeback in the Test match. Earlier in the morning, India were just blown away by the Aussie bowlers, not because of their brilliance but only the batters played some extremely poor shots. All of them went poking at the harmless deliveries outside the off-stump. Even Virat Kohli did the same and then it took a stunner from Usman Khawaja to send him packing. Rohit Sharma looked good for some time in his comeback game but even he threw his wicket with an atrocious shot after scoring a delightful 37. Rishabh Pant too had no idea what was going on and he hobbled his way through to 25 before leaving India in a mire at 127/6. But then the fighter names Cheteshwar Pujara did everything he could to double the score at the end of the day. The first session of the second day will be crucial now for both the teams. Meanwhile, the social media gimmicks were busy trolling Kohli and Co. for their failure and went on to make some hilarious memes while they didn’t forget to hail Pujara. After every ball, Mitchel Starc is going towards Rishabh Pant & saying something.. It reminds me the scene of Lagaan..
Get the latest Cricket News and updates from the Australia vs India series, Match Predictions, Fantasy Cricket Tips and lots more on CricTracker.com.